Do you or your colleagues ever suffer from DNA mania [3,4]? A biochemist friend of mine once semi-jokingly remarked that people’s manic obsession with DNA is a bit like buying some food and being more interested in the bar-code on the packaging, than the food inside. In his particular area of research, DNA is about as exciting as bar-codes, because it doesn’t even leave the nucleus of the cell, at least in Eukaryotes. 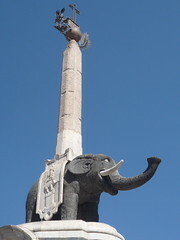 I wonder what readers of nodalpoint think of this analogy? Anyway, as a result of this philosophy, most of his community have developed an unhealthy and manic interest in proteins rather than DNA. You could call this particular obsessive-compulsive disorder “protein mania”. Depending on the scientific obsession(s) of your particular community, you might need to substitute Protein or RNA for DNA in the above quote, as appropriate. And if that is all too molecular for you, substitute any other of your favourite bioinformatics buzzwords. 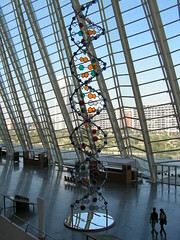 DNA Photograph taken by Unapersona in Ciutat de les Arts i les Ciències, Calatrava building, Valencia, Spain.